Discussion in 'General Multimedia' started by layman, Feb 19, 2014. Can you spot the plume of a rising Ariane 5 rocket in this surreal panoramic photo? 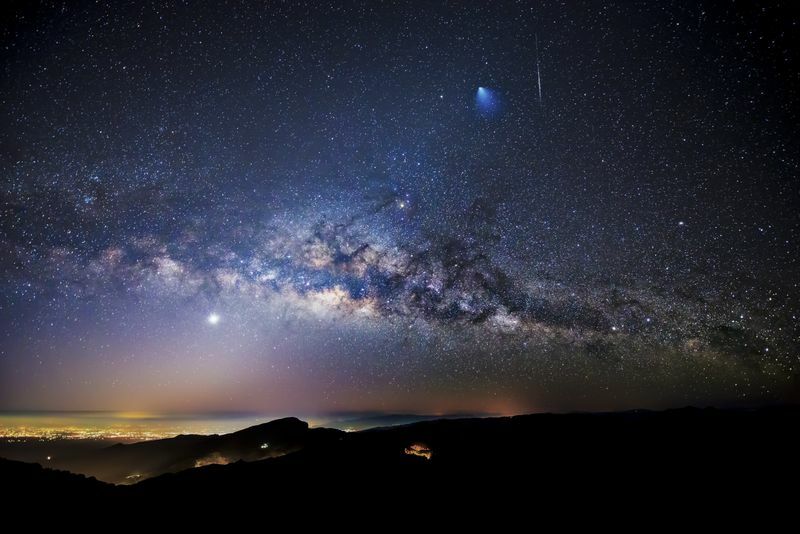 Taken on Feb. 7, the above image shows the Milky Way Galaxy, a fortuitous streak of a meteor and rising Ariane 5 rocket (on its 250th liftoff) launched few minutes before from Kourou, in French Guiana, in the night sky over Doi Inthanon National Park in Thailand. According to Space.com, the evening launch from the frontier of the Amazon jungle was postponed one hour lto wait for stormy weather to pass over the space base. The ascent lasted half-hour during which Ariane 5′s twin solid rocket boosters expended more than a million pounds of pre-packed powder propellant. Ariane 5 is an expendable launch system belongin to the Ariane rocket family, used by ESA (European Space Agency) to deliver payloads into geostationary transfer orbit (GTO) or low Earth orbit (LEO). Unable to find the rocket still ??? That brilliant blue jet beside the white streak top-center right of the pic. [MENTION=8921]Picdelamirand-oil[/MENTION] Wow look at that pic! Here’s why F-16 pilots take the most stunning selfies. Such as this one.